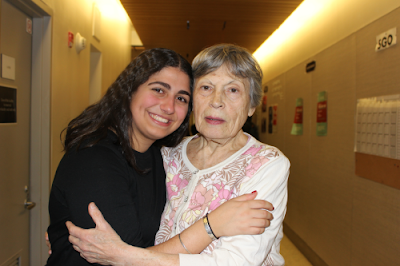 Congratulations to Stephanie Dweck (HS '16) on winning first place in the local and second place in the national Better Together Legacy Heritage Fund Better 2 Write contest! Stephanie, a member of this year's Witness Theater program, shared her experience working with survivors and being part of this intergenerational program. In her essay she discussed the lessons she learned from Maya, a Holocaust Survivor, that she became very close with during her year in Witness Theater. As a result of her first place win, Stephanie will receive a scholarship towards her year in Israel, where she will be studying at Midreshet Lindenbaum. For placing second in the national contest, Yeshivah of Flatbush will receive money towards the support of our programming. Better Together is a program part of a nationally known and respected foundation. We are very proud of Stephanie and all of her accomplishments.